Formerly known as the Inn at Blue Mountain Beach, the Blue Lupine Inn is a popular condo complex in South Walton, Florida. This 48 unit complex over looks the white sands and emerald waters in Blue Mountain Beach. With a fitness center, gulf front pool and hot tub, Blue Lupine Inn provides all the amenities needed for a relaxing beach vacation. Blue Lupine supplies covered parking for one car with additional parking just north of the building. The Blue Lupine Inn is very close to 30A which provides great shopping and dining. 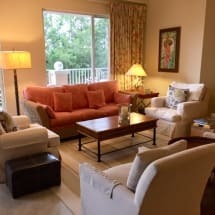 The complex offers the best of both worlds with quick access to Destin and other Santa Rosa Beach areas but also provides the privacy of your own retreat that over looks the beach. Some of the favorite local restaurants include Goatfeathers Seafood Restaurant, Due on 30a and Chiringo. Your vacation at the Blue Lupine Inn is sure to be filled with adventure and relaxation with so much to do and see. Plan your next getaway to Blue Lupine Inn with Emerald Coast By Owner. Browse our Blue Lupine condo rentals below. ECBYO will put you in direct contact with Blue Lupine Condo owners and will assure you are not paying any additional booking fees. We hope you enjoy your stay at Blue Lupine Inn!